Our 2013 article on Runtime Compiled C++ for Game AI Pro is now available for free online. 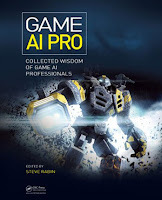 If you're interested in AI development the entire book can be found for for free at the bottom of the main Game AI Pro website. Scripting languages have always been a foundation of rapid AI development but with the increasing demands of AI, their performance drawbacks are becoming ever more problematic. On the other hand, traditional C++ development approaches generally lead to lengthy compile and link times, which limit the amount of iteration and testing that programmers can undertake. Though development tools are progressing in this area, developers still need to run the build and load content to see the end result, and edit-and-continue style approaches do not work for all codebases or changes.